If you are anything like myself and are still caught within the the lustrous, melancholic afterglow of "The Grand Budapest Hotel," Writer/Director Wes Anderson's finest film excursion to date, and you wish to delve even deeper inside the mythical Eastern European world of old, then look no further than The Wes Anderson Collection: The Grand Budapest Hotel, Author Matt Zoller Seitz's lavish companion book to his equally lavish and extraordinary publication The Wes Anderson Collection from just last year (and profiled in the March 2014 section of this site). As with Seitz's previous gorgeous tome, this new volume is triumphantly more than simply a celebration of Wes Anderson's most recent film. This is yet another meticulously researched and presented publication that gives the reader and fan a front row seat into Anderson's creative process while also creating a reading and visual experience that is as enlightening and as labyrinthine as the film itself. In addition to the plethora of film stills, behind the scenes photos, conceptual artwork, storyboards, screenplay excerpts, and interviews with the film's leading actor Ralph Finnes, Costume Designer Milena Canonero, Composer Alexander Desplat, Production Designer Adam Stockhausen and Cinematographer Robert Yeoman, Seitz provides us with three extensive interviews conducted with Wes Anderson during various stages of the film's post-production/pre-release period in which all manner of topics from cinematic influences, character motivations, story and plot developments to even the writings of Author Stefan Zweig (which inspired the film and some of which are also included within this book) were vibrantly discussed. Additionally, Seitz collaborates with a team of esteemed writers, playwrights, film critics, and film historians, including the University of Wisconsin-Madison's very own David Bordwell, who all contribute essays concerning various aspects of the filmmaking process (shot compositions, set design, visual effects, etc...) and how they each relate to Anderson's most recent opus. What results is a book that is deeply intoxicating, illuminating and surprisingly does not decrease the magic of the actual film itself. In fact, I feel that what Seitz has achieved with this book (just as he achieved with his previous installment) is to fashion a reading experience that serves to enhance the viewing experience of "The Grand Budapest Hotel," as one would easily be able to return to the feature film with an even greater appreciation for how it was all conceived and executed. And furthermore, viewing the film again, I feel, would inspire you to then return to Seitz's book to discover even more about the process behind the product. Most importantly, Seitz has also gone quite the distance in giving Wes Anderson full credence as a serious filmmaker whose cinematic escapades are made of the purest artistic intent and not smug, self-congratulatory, superior minded motion pictures meant to keep all potential audiences at arms lengths. 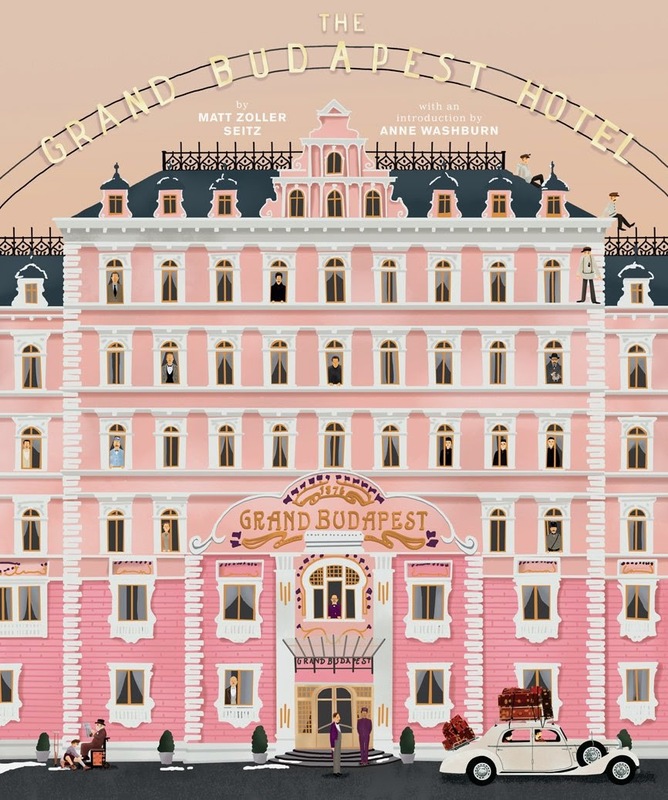 Matt Zoller Seitz's The Wes Anderson Collection: The Grand Budapest Hotel is completely inviting, unquestionably immersive and the perfect reading selection for fans of not only Wes Anderson, but of the full art and artistry of the movies. LOSING MY EDGE: a review of "While We're Young"
And they're actually really, really nice..."
Aging is a most peculiar experience once you hit your 40's, or at least, it has been a most peculiar and often uneasy transition for me. As I look backwards on my life, I can easily tell you that for myself, my late 20's felt to me to be like one long year spread out over quite possibly four years. The natural restlessness of the age notwithstanding, there just was this incessant need to not only try and discover a sense of purpose for my life but to also begin to feel comfortable within my own skin, all the while feeling as if I was not making any progress. Along with that, I had to begin dealing with those first realizations that maybe any fantasies I held about becoming a filmmaker or someone that carried some sense of public recognition was more than likely never going to happen. Or that if it did, it would occur in a way that felt comfortable to my own sense of integrity as the horror stories of the big, bad real world in cinema, publishing and the like only showed me that my skin is just too thin for industries that are famously cutthroat. Whatever happened would happen but it would have to be organic and on my own terms, therefore ensuring that wherever I found myself, it would felt right to my spirit. By the time I turned 30, I actually felt comfortable. I was comfortable within my own skin as if the number of my age felt just right with who I felt myself to be internally. By this stage of my life, certain avenues had begun falling into place. I was married, had begun my career as a teacher, and furthermore, forced myself to become a writer and cherish the title not through any sense of attaining public recognition but finding satisfaction with the artistic process itself. If I was going to call myself writer, then just get down to it and write! Of course, I continued to house fantasies of fame and glory (and I guess I still do) but again, between the ages of 30-34, it all felt as if I had finally arrived within my own life. And then, I turned 35. 35 was the first time in my life when I felt that the numerical value of my age did not represent me whatsoever. People began to refer to me as "Sir," which felt like a knife in the heart as well as the back for could these young people not see that I was obviously one of them? I still wore my ever present baseball cap. I still frequented the local record stores, movie theaters and was up on (then) current pop culture. Sure I had some gray hairs sprouting in my goatee but hey, those were earned weren't they? It didn't mean that I was necessarily getting old, did it? Older, certainly. But not old. 35 rapidly found itself at 40, 42 and now 46 and with each year, and regardless of how thankful I am to still be a part of this existence, the numbers have troubled me more than ever and almost to the point where I really don't even wish to acknowledge how old I am anymore. While I still wear my baseball cap and frequent the very few record stores that remain, I am not as up to the minute knowledgeable about current pop culture and I am shocked to discover that in many cases, I just don't care anymore, partially because I don't see the artistic value as compared to the pop culture that formulated me and partially because, I just can't keep up with it all. I don't own a smart phone. I don't text. I don't utilize Twitter and I do harbor an inherent distrust of some aspects of advancing technology and the ever encroaching and less private world of social media, especially for the generations behind me.and what it may mean for our collective future. And furthermore, the gray in my goatee has nearly taken over. What is happening to me? All of those emotions sit at the deeply perceptive core of Writer/Director Noah Baumbach's "While We're Young," his seventh feature film and as far as I am concerned, it is the very best film he has released in the 10 years since his extraordinary family drama "The Squid And The Whale" (2005). I have to first express to you that I was just about ready to give up on Mr. Baumbach as the films he has released since "The Squid And The Whale" have only disappointed me to varying degrees. Where "Margot At The Wedding" (2007) was just an ugly escapade that did not pay off whatsoever, his more recent and critically acclaimed features "Greenberg" (2010) and "Frances Ha" (2012) to me felt to be increasingly smug, self-congratulatory and painfully plastic excursions that didn't feel to constructed out of anything seemingly honest, therefore making themselves to be nothing more than hipster fabrications of real life. By contrast, "While We're Young" is piercing and poignant, uncharacteristically warm (for Baumbach) yet righteously and rightfully bitter and never once strikes one false note. It felt as if Baumbach had taken some of the thematic frameworks of "Greenberg," "Frances Ha" and even his debut feature "Kicking And Screaming" (1995) and fashioned what just may be his most complete screenplay and therefore, his most multi-layered film to date as he takes us through an odyssey of middle age ennui, fear and confusion as it clashes against young adult ambition plus also functioning as a smart social commentary and screwball romantic comedy which even has ample space to house a central mystery and even some very funny scatological humor. We have a few weeks before the behemoths of the Summer Movie season take over the theater screens so, I do indeed happily urge you to head out for this film, even if it does make you look uncomfortably at yourself. "While We're Young" stars Ben Stiller and Naomi Watts as Josh and Cornelia Srebnick, a New York based documentary filmmaker and his wife, a documentary film producer and the daughter of legendary documentarian Leslie Breitbart (a most welcome return from Charles Grodin). Josh and Cornelia, now in their mid-40's, are struggling with the choices, twists and turns their lives have taken over the course of their relationship and while still madly in love, they have found themselves stuck in a rut. After one completed and vastly underseen documentary film, Josh has been ensconced in the tedium of creating a follow-up feature...for 10 years. The couple's best friends, Marina (Maria Dizzia) and Fletcher (Beastie Boys' Adam Horovitz in a fine, relaxed performance), also in their mid-40's, have now become first time parents, making Josh and Cornelia feel alienated and unfulfilled as they are childless due to two past miscarriages. Feeling adrift, it is almost a miracle for Josh and Cornelia as they meet and build a hearty friendship with Jamie (a terrific Adam Driver) and Darby (the subtle and strong Amanda Seyfried), a married couple in their mid 20's. Jamie and Darby are charming, open, and eager individuals who befriend Josh and Cornelia graciously. They house vast music collections upon vinyl, watch VHS cassettes, invite the older couple to block parties and seemingly hang onto every one of Josh's self-perceived pearls of wisdom. Additionally, as Darby makes her own ice cream, which she is in the process of selling. and Jamie is an aspiring documentary filmmaker and fan of Josh's past work, Josh and Cornelia are not only swept away by the seemingly free-spirited couple, they each witness doors into their own pasts and they chart their respective futures. Soon, Cornelia is taking hip-hop dance classes with Darby, Josh adopts to wearing pork pie hats and wingtip shoes to emulate his own youth as well as the youthful confidence Jaime represents, and they both cast off their oldest friends in pursuit of this virtual fountain of youth. But are the two couples as compatible as they seem or even wish to be, especially as the ideals of two generations may not be as in sync as hoped? Noah Baumbach's "While We're Young" is a perfect candidate to exist as a companion piece to Writer/Director Judd Apatow's "This Is 40" (2012), as Baumbach has crafted an experience that is perfectly in tune with both of the generations it is representing, as well as the emotions and motivations contained with the characters. With "France Ha," I just felt as if every single moment within that film from characters, motivations, performances and even dialogue all existed within sets of invisible quotation marks. With "While We're Young," those feelings were entirely non-existent. Baumbach has crafted a wise, very funny and often deeply acerbic film, filled with a vibrant and literary wit that fuels a collective of characters that are instantly recognizable, especially as the features within these characters are remarkably and again, uncomfortably like our own. I loved how Baumbach did not make any wide-sweeping generalities about the two different generations depicted in the film and in fact, he sort of upended them. Yes, there is a terrific montage sequence early in the film which depicts the mid-40's Josh and Cornelia are more socially isolated and attached to technology while the mid 20's Jamie and Darby are more outgoing and social. Where Josh exercises alone with earbuds in place inside of a health club, Jamie plays basketball with friends on outdoor public courts. You get the picture. But soon, Baumbach slowly and smartly complicates and deepens matters, especially once we arrive at sequences where the core moral values inside of the characters become revealed, thus making "While We're Young" work as a decidedly pointed social commentary. Noah Baumbach asks extremely difficult questions for each generation as well as having the characters perform the same tasks of themselves. With regards to the 40's, as represented by both Josh and Cornelia, we are seeing two people dealing with issues of relevancy and mortality. On a more immediate level, Josh and Cornelia are coiled inside of an existential crisis where they are each wondering if they, and the ideals with which they have formulated themselves, have become obsolete, therefore fading each of them into obscurity. Have they actually become the very people society thinks they should be by this time in their lives? Or even more probing, what Josh and Cornelia perceive society wants for them to have achieved. Josh and Cornelia are each faced with questions of what the true definition of success actually means, especially as Cornelia feels societal pressure with not being a Mother and Josh is forever engulfed with his cerebral documentary that may never get finished. As their relationships with Jamie and Darby grow closer and more intertwined, we also gather the sense that as Josh and Cornelia look at their new friends, they are not only seeing versions of themselves in their respective 20's but also the perceptions they have held of each other, making Josh and Cornelia begin to each resent the other for not becoming who they felt they should have become. With regards to the 20's, as represented by Jamie and Darby, what begins as something more free wheeling and carefree ultimately reveals itself as being much sharper than Josh and Cornelia have begun to realize. Especially, with Jaime, we have characters who are much more opportunistic, cunning, savvy, and duplicitous than first perceived plus the added bonus of being industrious and uniquely talented. Once Josh and Jaime become friends, it is a relationship where Josh, at first, feels charmed and even disarmed by Jaime's admiration and openness. And the relationship then progresses from one that Josh (again) perceives as being "Mentor/Protege" to one where they become rivals and creative competitors, to the point, where Josh is supremely unnerved by Jaime's rapidly approaching footsteps. In fact, Jaime's entire aesthetic is cloaked inside of a "means to and end" quality that sets itself up for late film confrontations between himself and Josh, which even further finds itself inside of a generational battle of ethics and even levels of narcissism. With "While Were Young," Noah Baumbach is asking us, from generation to generation (and in this case, I would suppose "Generation X" and the "Millennials"), what are the ideals that shape us? What are the morals that have we grown up with that helps to formulate how we wish to navigate the world? More specifically, when you have a generation, unlike my own, where so much of their lives have been documented and technology has become the tool to continue an unhealthy level of narcissism, what does that mean for the future? Near the opening of the film, as Josh is giving a lecture, he expresses that documentaries should not only be about the subject at hand but also a personal statement about the filmmaker. Yet, by film's end, he questions what a documentary even is anymore to a generation that is constantly filming themselves. The film's final image, which of course, I will not reveal, is a killer, as Baumbach delivers an image that made me feel the impending and possibly inevitable decay of our societal morality and the effect was surprisingly chilling and profoundly effective. Ben Stiller and Naomi Watts are pitch perfect and completely convincing and winning as our middle aged heroes. Stiller, in particular, has really found himself to existing as the perfect conduit for Baumbach's parables, as they allow him ample room to stretch his dramatic muscles while still giving him considerable space to demonstrate his unquestionable comedic skills and impish subversiveness. And yet, how strange it was to see the lines of age slowly embedded into Stiller's face as well as Naomi Watts', who remains as lovely as ever but even still, it is happening. But, what of Adam Horovitz, the former Beastie Boy who is now adorned with not only the same lines of age but a mop of hair that is completely gray? Are they, and therefore are we all really getting older like this? Again, this is happening. It's really happening. "We're old men," Horovitz as his character Fletcher exclaims with a bemused expression to Stiller's Josh. Maybe so and therefore I may need to begin facing a certain reality. And yet, I can and I can't. Noah Baumbach's "While We're Young" taps so specifically into this quandary that it is truly a surprise that the film is as enormously entertaining as it is. While I'm not sure if "While We're Young" will end up as one of the best films of 2015, I am so thrilled that it is Noah Bambach's best film in many years. Welcome back, Mr. Baumbach. Take off your coat and stay a while. To begin, I must publicly offer my endless and most heartfelt apologies to Terry Bell for having his DVD copy of this film for far too terribly long. To continue, I must reveal to you a confession that just may surprise many of you: Until just last night, I have never seen "Shaun Of the Dead." Yes, dear readers, you did read that correctly. I have never seen "Shaun Of The Dead," Co-Writer/Director Edgar Wright's breakthrough feature film as well as his second feature length directorial effort overall, and now that I have, I now understand what all of the fuss has been about over these last 11 years since its original release as it did not disappoint in the least. In fact, I am kicking myself quite a bit for not having seen it sooner and therefore, having been aware of the immense creativity and inventiveness that is housed inside of the mind of Wright from essentially the beginning. I do remember seeing the trailer many years ago and feeling that it looked to be a film that I would indeed head out and see. But, for whatever reasons, when "Shaun Of the Dead" was released, I just never made it out to the theater to see it and once it hit home video, for whatever other reasons, I just never rented it and then, time passed, more and other movies entered my life and like so many films that I haven't seen, "Shaun Of The Dead" just found itself being swept aside. And here is where Terry Bell enters the picture. I met Terry Bell many years ago while teaching at a preschool where he was also employed part-time and in addition to his daily morning news duties as an on-air announcer/journalist on Wisconsin Public Radio (yes, I do have my connections here and there). If you were to meet Terry, I really believe that you would be fully taken in by the immediate level of his sincerity, openness and kindness as he truly represents what a "gentleman" is and should be. He also does indeed carry quite the subversive streak to his spirit as evidenced by our mutual love of Kevin Smith films and his natural sense of humor which can exhibit a high satirical streak when he wishes to share it. So, when he first expressed to me his massive enthusiasm for "Shaun Of The Dead," it didn't surprise me but it certainly did indeed inform me that if he found value to that film, it would be worth my time to view it. And yet, I still didn't rent it. Terry had invited me to his home to watch it on many occasions but I could never get my schedule to link up with his. So, finally, he loaned me his personal DVD copy of the film for me to watch at my convenience, to which I was most appreciative and definitely had the full intention of watching it right away. But, upon a shelf, right my my television, it sat. For years...and again, to Terry, I deeply apologize. Within those intervening years, I finally became officially acquainted with Edgar Wright via his two most recent films, the stunning, one-of-a-kind video game fantasia "Scott Pilgrim Vs. The World" (2010) and the outstanding apocalyptic science-fiction excursion and middle age ennui satire "The World's End" (2012), In those two movies, I was witness to a filmmaker of immense talent, an undeniably feverish level of creativity and one who possessed a cinematic eye that is firmly unique, idiosyncratic and filled with a rare and downright joyously gleeful storytelling outlook. Both "Scott Pilgrim Vs. The World" and "The World's End" felt as if Wright was randomly pulling every single idea from the inside of a revolving madhouse but in actuality, the films were so meticulously constructed and choreographed that if just one element were to be out of place, the entire escapade would fall to pieces. I distinctly remember as I watched both of those films, with my mouth often wide open in amazement, that I had thoughts that there would be no conceivable way that this high amount of energy and inventiveness could sustain itself for the entirety of the whole film and in both cases, I was happily proven wrong. And still...for whatever reason, and again, even with the film just sitting right near the television, I still didn't watch "Shaun of The Dead." Yet, something compelled me to just go ahead and watch the film last night, for maybe, the time was right. Something in the atmosphere or something just as ephemeral but yes, I placed the DVD into the player and began to take the ride. As many of you are already so deeply familiar, "Shaun Of The Dead" stars the film's Co-Writer Simon Pegg as the titular Shaun, a 29 year old electronic store employee in suburban London, whose life is caught in a directionless rut. Being disrespected by his younger employees, fraught with an estranged relationship with his Mother Barbara (Penelope Wilton) and his Stepfather Phillip (Bill Nighy), and enduring tensions with his flatmate Pete (Peter Serafinowicz) over the endlessly annoying presence of their other flatmate and Shaun's life-long best friend, the lazy, flatulent, perpetually unemployed (save for the occasional drug deal) Ed (Nick Frost), would be bad enough. There is Shaun's long running yet tenuous relationship with Liz (Kate Ashfield), now at the three year mark and stuck in the same groove of spending night after night at the local pub The Winchester...with Ed plus Liz's flatmates the stuffy, bespectacled David (Dylan Moran) and his girlfriend, struggling actress Dianne (Lucy Davis of the BBC's "The Office"). After one broken promise too many, Liz dumps Shaun thus forcing him to seriously re-think the course of his life plus devise a way to return himself to Liz's good graces. But there's a little matter of a zombie apocalypse that has suddenly made an outbreak throughout the town, forcing Shaun and Ed to retrieve their friends and family to bunker down within The Winchester, which an army of hungry zombies have surrounded. If there ever was a time to grow up and take charge of one's life, there is no better time than during a zombie attack. Is Shaun up to the task? In being such a late arrival to the Edgar Wright party, so to speak, it was a strange feeling finally watching "Shaun of The Dead." It was kind of like reading a book completely out of order, starting with the latest chapters, then moving back and forth a bit before settling into reading the beginning, as conceptually, "Shaun of The Dead" serves the first installment of the self-described "Three Flavours Cornetto Trilogy" of films from Wright, Pegg and Frost, which includes "Hot Fuzz" (2007) as the second installment and "The World's End" as the final entry. Now that I am more aware of Wright cinematic aesthetics, it was interesting to see how far he has developed them with his more recent films but to then see how they originated...and to that end, just how skilled he was in the first place. "Shaun Of the Dead" is a film that may essentially feel like a one-joke movie but is in actuality, a wonderfully multi-layered experience On one level, the film serves as an homage to both Director George A. Romero's "Dawn Of The Dead" (1978) as well as Writer/Director John Landis' iconic amalgamation of horror and comedy, "An American Werewolf In London" (1981), In addition to Wright's now signature visual razzle dazzle, Wright and Pegg's screenplay is filled from one end to the other with delightfully arranged witticisms and wordplay which is all delivered in a rapid fire style akin to a 1930's screwball comedy or a film starring The Marx Brothers, making for a film that is a graceful as it is gory. As a thriller, Wright just nails the sense of terror perfectly. As in the early films of Steven Spielberg, Wright stages his story in a somewhat nondescript sleepy suburban area instead of London based landmark, thus bringing the extraordinary right in the middle of the very ordinary, which is first exhibited in a wonderful and unedited tracking shot where Shaun heads to the market from his flat, and we gather the mundane splendor of daily life in his neighborhood before it is all torn to shreds. As with Writer/Director M. Night Shyamalan's "Signs" (2002), Wright stages much of the apocalypse off-screen, which for me, increased the sense of paranoia and unease that exists for quite a long stretch of the film and remains steadily intact even as I was laughing at the dialogue and sight gags. No easy feat, handled brilliantly and I think that even John Landis himself would be proud. I enjoyed that the arrival of the zombies was never fully explained in the film, which also created a certain amount of intensity. Any ideas of what is happening upon a larger scale are only depicted in quick flashes of newspaper headlines, abbreviated newscasts and very quick shots of abnormalities (people dropping dead in the street or flashes of persons running in fear through the camera frame, for instance) and seemingly innocuous moments that actually signify encroaching doom (people suddenly falling ill, complaints of headaches, coughing). These are moments that almost trick you into making you wonder if you saw and heard what you did indeed experience an d it is honestly effective and does provide the proper scares while not sacrificing any of the comedy. One extremely clever bit occurs while Shaun is flipping channels to try and find out any information and if you haven't seen the film yet, just try and solely pay attention to the audio from each channel, which is presented only in snippets and fragments, yet when strung together actually presents a full news update. By the time, the zombies have been fully revealed, Wright continues to keep us off balance as he keeps mining the comedy even through some horrific gross out effects. When Shaun and Ed at long last realize that there are zombies right in their garden, the means at which they do comprehend the danger plus how they undertake measures of properly killing the zombies are sharply hysterical. If armed with only a stack of record albums, which ones would you use as a potential weapon? Prince? Dire Straits? New Order? The debates are hilarious and remain so, even as your palms begin to sweat. Then, there is another very funny sequence where Dianne takes center stage as she attempts to utilize Method Acting techniques for herself and her friends so they can surreptitiously make their way across town to The Winchester amidst swarms of zombies undetected. Just terrific physical comedy occurring just as you're waiting for carnage to blaze out at you. Once the action moves to The Winchester and the scares, action and gore becomes more intense (one major character meets a particularly grisly end--NO SPOILERS if you haven't seen it), Wright still somehow finds ways to make the comedy and the overall uniqueness of "Shaun Of the Dead" stand out. One terrific fight sequence in particular, during which Shaun, Liz and Ed while brandishing pool cues take on one hungry zombie as the jukebox blares Queen's "Don't Stop Me Now" is as blissfully executed as the finest movie musical. Again, this sequence, which is a precursor to the dizzying, exhilarating and staggeringly choreographed fight sequences to come in "Scott Pilgrim Vs. The World" and "The World's End," shows just how breathlessly creative Wright was from the start. But then, and most surprisingly, was that element of pathos I mentioned earlier. 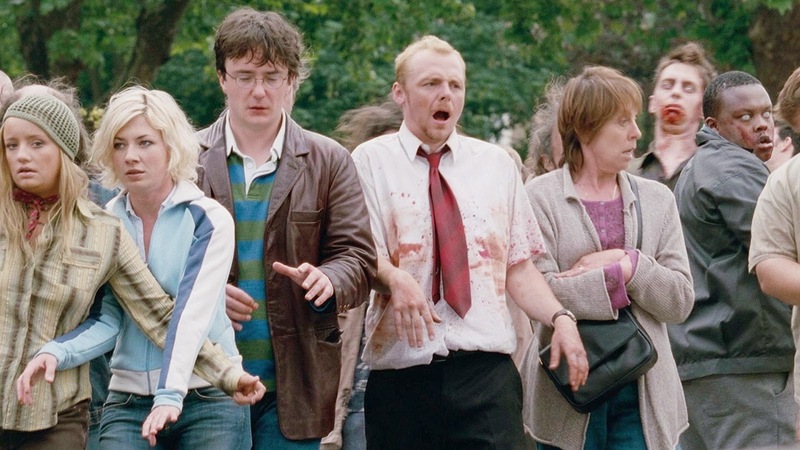 In addition to action and horror, "Shaun Of The Dead" actually boasts a decent love story and one where the female (usually given short shrift and all manner of cliches in such a male-centric film) is actually given quite the conundrum which flies to an existential crisis. Kate Ashfield's Liz is presented as the stereotypical long-suffering and neglected girlfriend who is constantly brow-beating her man (in this case Shaun) for not being motivated. Additionally, they are a couple that never gets to be alone as Ed is always in tow, a reality that forces Liz to bring about her flatmates so she won't be lonely. The true crux of the relationship is The Winchester itself, the symbol of Shaun's ultimate inertia and the bane of Liz's existence as she wishes to not spend even one more night inside of the pub for this is where she has spent essentially every night for three years while dating Shaun. Once the zombies descend upon the town and our heroes take up refuge inside of the Winchester, Wright very slyly plays the location as eliciting different responses and feelings from different characters. Where it is solace and comfort for both Shaun and Ed, it is nothing but purgatory for Liz. To think, that the place that she never wanted to set foot inside of again is the place where she just may be eaten alive by zombies. So, what to do? Either accept her doom or howl against the universe and try to fight her way out, and if she fails, at least some zombies will go with her. Her level of action perfectly suits what we know about her from the early parts of the film regarding her emotional maturity and her desire to live and experience life to its fullest. Certainly zombie fighting was not ever in the plans that she made for herself but she remains true to herself all the while, promising to go down swinging if she has to. "Shaun Of The Dead" also carries the theme of arrested development as mostly viewed through the friendship, and therefore, love story between Shaun and Ed. While comical throughout, Wrigh somehow finds a certain sense of honest emotion in the proceedings to give sincere weight to the situations for our heroes as they grow more dire while trapped inside The Winchester. With Ed, and especially after establishing him as a useless layabout, Wright positions him as being quite possibly the most prepared person to handle a zombie apocalypse because his mind dulled by a lifetime of playing video games has indeed made him the most desensitized to the whole affair. He actually kind of enjoys the arrival of, and therefore the act of killing zombies, as if he is living inside of a video game (shades of themes to come in "Scott Pilgrim Vs. The World"). That being said, his heart is also the largest, most loyal and he makes one of the largest sacrifices in the film for nothing more than his friendship with Shaun, and I was surprisingly touched. Then, there is Shaun himself who does indeed snap to life once the zombies arrive. Yes, Wright is clearly taking a page from the Romero playbook by suggesting that we, as a society, are already zombies stuck in our daily rituals on auto-pilot. But, in Shaun's case, we are given a film that charts his path into adulthood. For instance, it has been expressed that one never fully grows up until one's parent dies. In this film, Shaun is faced with the impending mortality of both of his parents and he is indeed forced to make a fateful and honestly painful choice while inside The Winchester--easily the film's most wrenching scene and Simon Pegg really gives it all he's got on a most convincing dramatic level. With both "Shaun Of the Dead" and "The World's End," Wright has given us parables that detail characters respective fears of the future. While the main character in "The World's End" attempts to keep the future at bay by trying to make his glory days of the 1990's last into his 40's and ultimately, forever, "Shaun of The Dead" features our hero trying his damnedest to hang onto the present for as long as possible so the future will just nt arrive at all. If everything remains the same, then painful process of change and then, growing up won't have to be endured. But as the zombies attack, Shaun very quickly realizes that he has the capability to be a leader, to be inventive, to think on his feet, to discover untapped levels of bravery, honor, resourcefulness and to not just succumb to his worst and laziest impulses. Since I had seen Wright's later films first and have seen essentially just how much further he has taken his unquestionable filmmaking gifts, that is purely the only reason that I didn't award "Shaun of The Dead" four stars. Think of it like this: Say the very first Wes Anderson film you saw happened to be "The Grand Budapest Hotel" (2014) and then, you happened to see "Rushmore" (1999). I think seeing "Shaun of The Dead" now is akin to something like that. But no matter, I have just ordered myself my own DVD copy to add to my personal archives and I feel that I had better check out "Hot Fuzz" while I am at it. And in the meantime, Terry, let's hook up, so I can at least, finally get your DVD back to you! For the second time since the inception of Savage Cinema, I have just exited a month that essentially produced little to no activity from me. This time around was due to an onslaught of work from my real world/professional life plus a most persistent illness (which I am still recovering from--just a nasty sinus infection, no worries) that had sapped my energy to no end. There were several times when I sat in front of the computer with the intent to try and compose a new feature and I would end up finding myself staring into space, essentially falling asleep with my eyes open as I was so fatigued. Frankly, if it were not for the 15th anniversary of Director Stephen Frears' "High Fidelity,"which I was compelled to commemorate, the month of March would have had nothing to show for it at all!! Now we arrive at April and I am curious if this month will have much to show for itself either. I took a peek on-line at the film releases scheduled for this month and I have to say that not even one title caught my attention and if that holds true, then this will be the third month in a row when I have not ventured out to the movies. I wonder if this means that 2015 will be one of those years, a year in which not much material that captures my fancy will be released until the later portion of the year. Yes, May already holds at least two MAJOR features that I would purchase tickets for right now if I could but that said, just think back to one year ago when by this time, I had already seen "The Grand Budapest Hotel," "The Lunchbox," "The LEGO Movie," "Captain America: The Winter Soldier" and "Under The Skin"! 2015 has already suffered by comparison. So, what does this mean? Well, I do already know what one feature will be for this month and it will be a special one but aside from that, let's see what the month may inspire for me as I do wish to keep Savage Cinema very active and alive--which means new material will arrive even when I don't head out to the theaters. Until the first feature of the month arrives, wish me luck and as always, I'll see you when the house lights go down!